TV Producer and Film-Maker…always in search of the next adventure! Well it’s a bright but chilly Sunday and I’m down here at the legendary Ace Cafe, hanging out with hundreds of other bikers who, like me, have come to wave off Steph “One Woman One Moto” Jeavons on her round-the-world bike adventure. 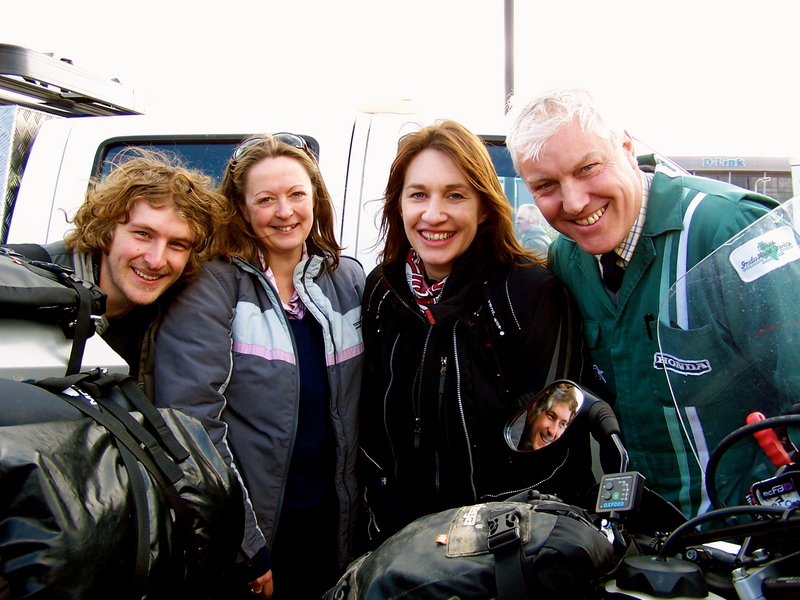 Despite the cold, the air’s been buzzing with the usual chatter that happens when you get a lot of adventure bikers in one place – talk of two-wheeled trips to far-flung places, exchange of notes on travel gear and bike bits, and, on this occasion, lots of envy about another biker setting off on another exciting round-the-world trip. Steph rode off on her epic journey a couple of hours ago now. I chatted to her just before she climbed onto her bike to head off. She was feeling a mixture of trepidation and excitement, and genuinely pleased at how many people had turned up to see her off. Austin Vince was there to give her a few final words of encouragement – and a “lucky” Mondo Sahara badge to wear on her travels. All around her, people pressed forward to get a good look at “Rhonda the Honda”, her CRF 250L, all packed up and ready to roll. 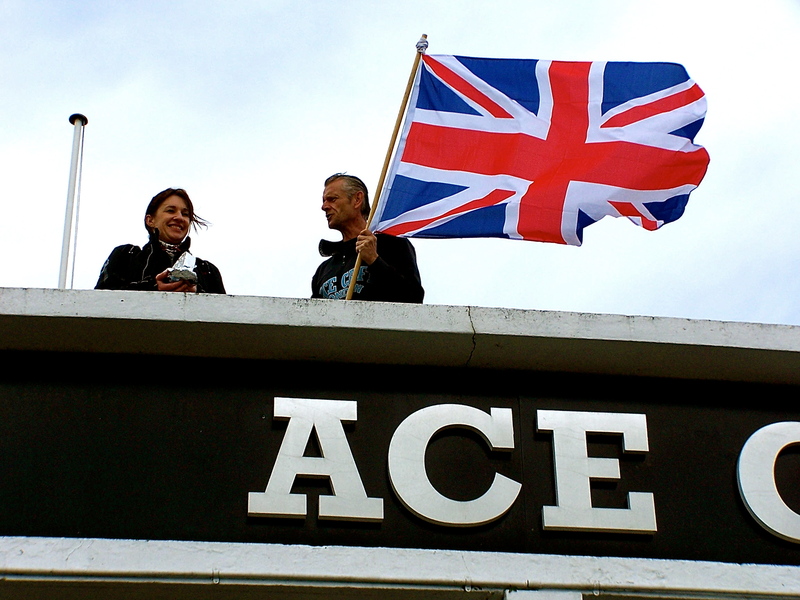 After waving goodbye to the crowd from the Ace Cafe roof and hugging friends and family, she was off! I could only imagine what must have been going through her mind at that moment – probably something like, “Please don’t drop the bike!” or “Did I turn the oven off?” Whatever, Steph’s got a whole lot of adventure ahead of her and I for one will be following her all the way. 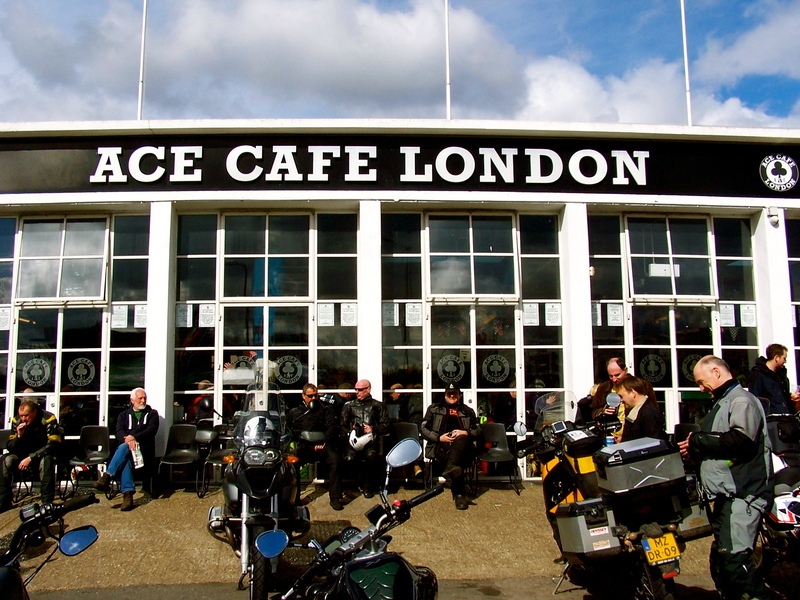 After the excitement of the send-off, the Ace Cafe is still buzzing here. I’ve been catching up with lots of familiar faces including the lovely Sam Manicom and Iain Harper, as well as ogling all the bikes that are parked up here. (Well, seems rude not to!). I’ve also had the opportunity to say a proper hello to Dom Giles and tell him how much I loved his book, Gone Riding. If you haven’t read it yet, jump on Amazon and get a copy right now: it’s the story of his 30,000-mile bike ride through 18 countries, including Panama to Alaska and Southern Africa. Today Dom told me he wrote it “from the heart” – and trust me, it really shows in his writing. Well it’s freezing cold here at the Ace Cafe and I’m off in search for another hot coffee. It’s been a great day all round – and of course, good luck to Steph on her epic adventure! 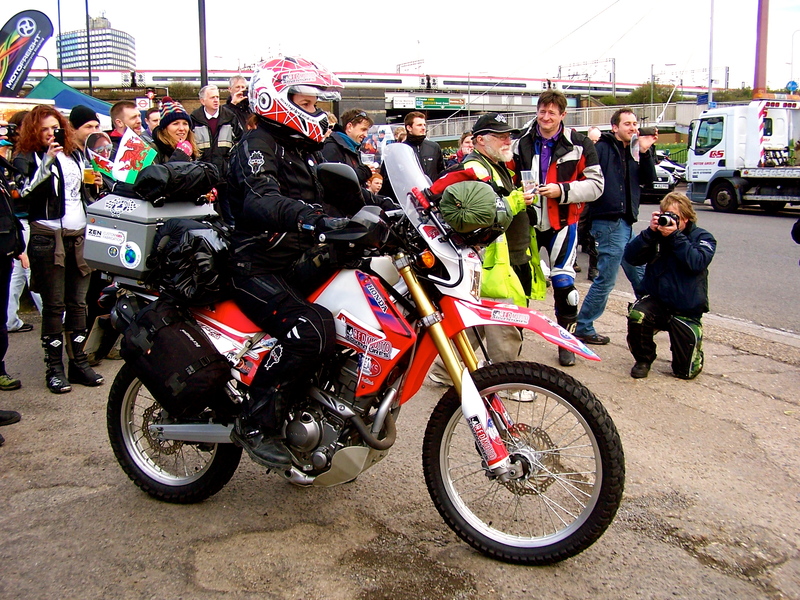 This entry was posted in Adventure Travel, Motorcycling and tagged Ace Cafe, adventure, Austin Vince, Dom Giles, Gone Riding, Iain Harper, motorcycling, One Woman One Moto, Red Moto Adventures, round the world, RTW, Sam Manicom, Steph Jeavons on March 23, 2014 by Jeanie Davison. Horizons Unlimited The ultimate adventure travel website! Jupiter's Travellers: Ted Simon Foundation Encouraging those who adventure into the world to go the extra mile and transform their experiences into something of value for the world to share. Enter your email address to subscribe to Jeanie's blog and receive notifications of new posts by email.